This city of 88,000 inhabitants has decided to gamble on the future and teach children the art of eating well. Meals are served in the classrooms by the pupils themselves. When the lunch bell rings in konan elementary school in Fukuroi, in Shizuoka Prefecture, everyone knows what to do. As in many other Japanese schools, the tables are rearranged and meals are eaten in the classroom. It’s the pupils themselves who take turns to serve their classmates. Supervised by adults, those whose turn it is don a white coat and a hairnet, wash their hands and go down to the ground floor to collect the trolleys containing the hot meals, delivered a few minutes earlier in a van from the central canteen. on today’s menu there’s samara, a local fish served in a sauce, vegetable soup with pasta, and two slices of bread with chocolate spread. To drink, there is a carton of milk. “I talk to them for a few minutes during the meal about the food they’re eating. I tell them where the ingredients come from and the food groups they belong to. My role is to teach them about a healthy and varied diet, to encourage them to improve their eating habits and persuade them to give proirity to vegetables and seasonal products. I also make them aware of waste by telling them all about the work of the local farmers, for example. Throwing away food is all about a lack of respect for those who’ve worked hard to provide it, and the children are very open to this argument. It encourages them not only to finish their meals but also to try something they wouldn’t want to eat in the first instance,” she adds. ISHIZUKA Koji keeps a close eye on the programme. He is one of the people in charge of the central canteen and oversees the city’s school meals service. He was the one who instigated this successful nutritional programme, which was awarded a prize last year for good practice in the educational sphere at the 8th Global Conference of the Alliance for Healthy Cities in Malaysia. His idea was simple but extremely effective: by dramatically improving the links between the 26 producers of food in the city and the central school meal canteen, he ensured that Fukuroi was able to create and deliver a variety of balanced meals to a large majority of the city’s school children while, at the same time, boosting the local agricultural economy. “A nation-wide study highlighted the fact that in the country as a whole, the diet of Japanese children was very deficient in calcium and that some groups of food rarely appeared on the menu,” he tells us. 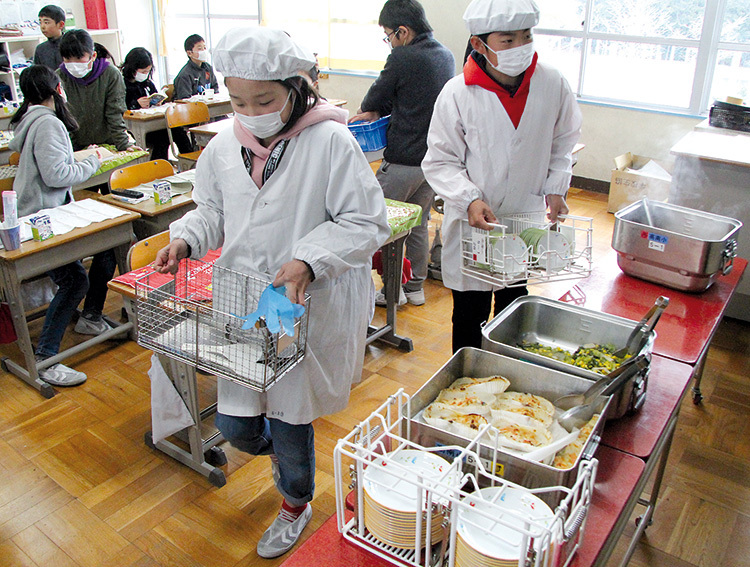 “we thought about how to overcome these problems so as to optimise the nutritional benefits of each meal while making sure they remained tempting for the children.” The kitchens of the central canteen in Fukuroi, which were launched in 2013 and employ 80 people, provide food for fourteen nursery schools, eighteen elementary and four primary schools, have only one rule to follow: no skimping on either taste or quality. And to achieve this, when beef burgers are served to Fukuroi’s schoolchildren, they are made entirely by hand, as are the harumaki (fried spring rolls). yet another example is that, before being cooked, all the vegetables are hand washed, and leafy vegetables such as cabbages are spray rinsed in order to “remove all the dust and stubborn insects.” This procedure – with its many precise details – is unique, even in Japan. The menus are never decided in advance; it’s the teaching staff, with the support of the nutritionist, who devise the menu each month depending on both what is available and nutritional requirements, but also what the children like to eat. It’s 10 o’clock in the morning, on 62-year-old SuzukI Toshiyuki’s small farm. 10 years ago, he gave up his salaried job in business to become a farmer and produce vegetables such as bok choy (Chinese cabbage), as well as spinach or its Japanese equivalent, komatsuna. Bok choy is one of the mainstays not only of local production in the city of Fukuroi, but also for the kitchens of the central canteen, which is one of this local farmer’s most important clients. He alone represents “an annual volume of 10 to 12 tonnes,” he says delightedly. “It’s quite an easy vegetable to cultivate, even in winter, as it doesn’t need a lot of care and grows well in greenhouses.” It can be harvested about forty days after germinating. He uses only organic fertilizer in the soil to grow his vegetables – no chemicals. And to water his plants, SuzukI Toshiyuki has opted for a system that reproduces the effect of light rainfall for one hour every day in his plastic covered greenhouse.